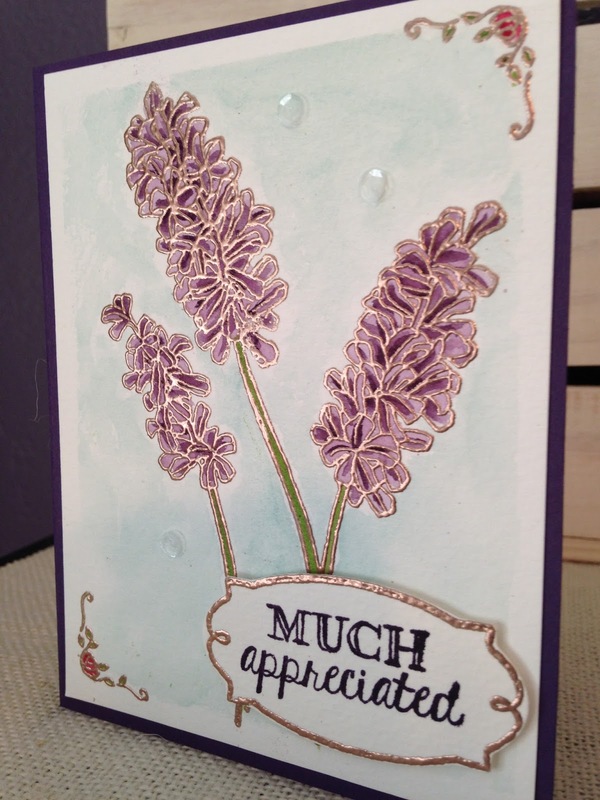 Another beautiful retiring Stampin’Up! set, another one I hate to see go. As I am just beginning my blogging…career?…not sure what to call it yet. Lot’s to learn still about this tech world. Anyway, if you follow me you will see in fairly short order, that I love all things floral. It is highly unlikely that I will ever “approve” of any floral stamp set retiring. Not that anyone is asking. I water colored these with my beloved Aqua Painters…best craft invention ever…water in the brush…how convenient is that! I used Calypso Coral and Wild Wasabi ink and card stock for the cards above. I gold embossed first. I used Whisper White card stock rather than water color paper, like I used for the card below. 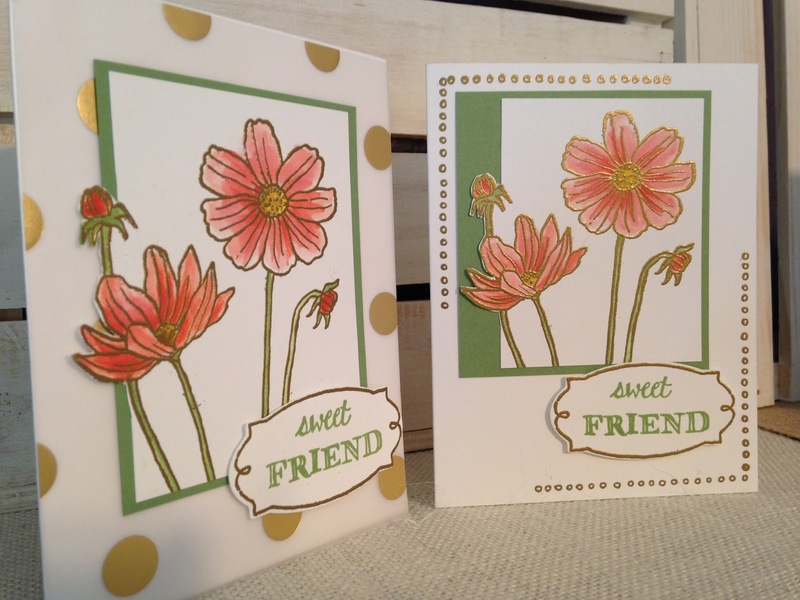 I used copper embossing powder here…just love the copper color! I used Wild Wasabi, Elegant Eggplant, Perfect Plum and Soft Sky for the ink…oh yeah, and Rose Red for the tiny flowers in the corners. Thanks for taking a look at my cards! How beautiful are these? 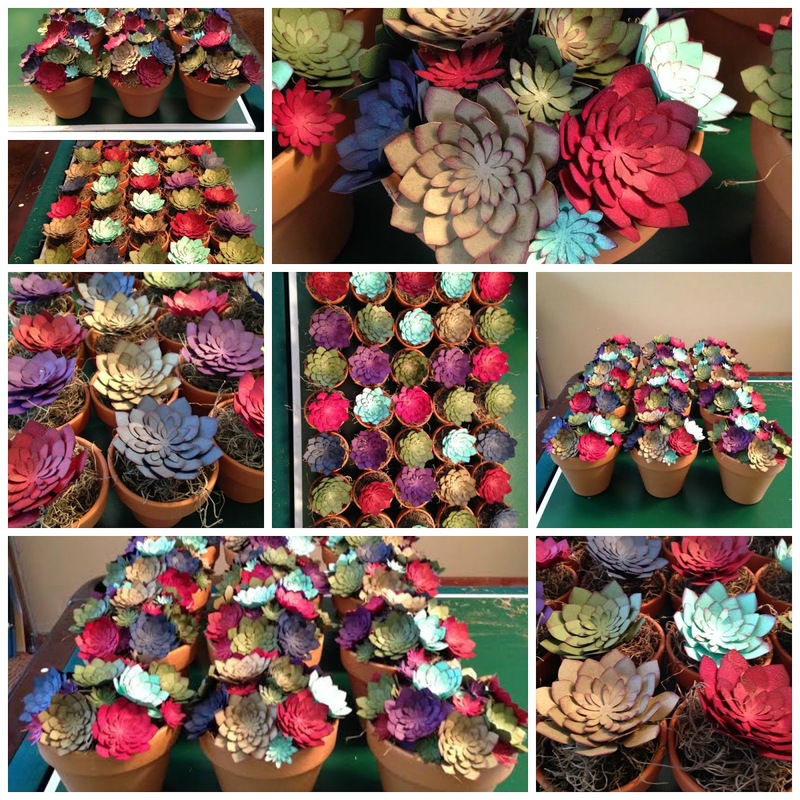 My good friend, Patti Costales made ALL of these succulent blooms! 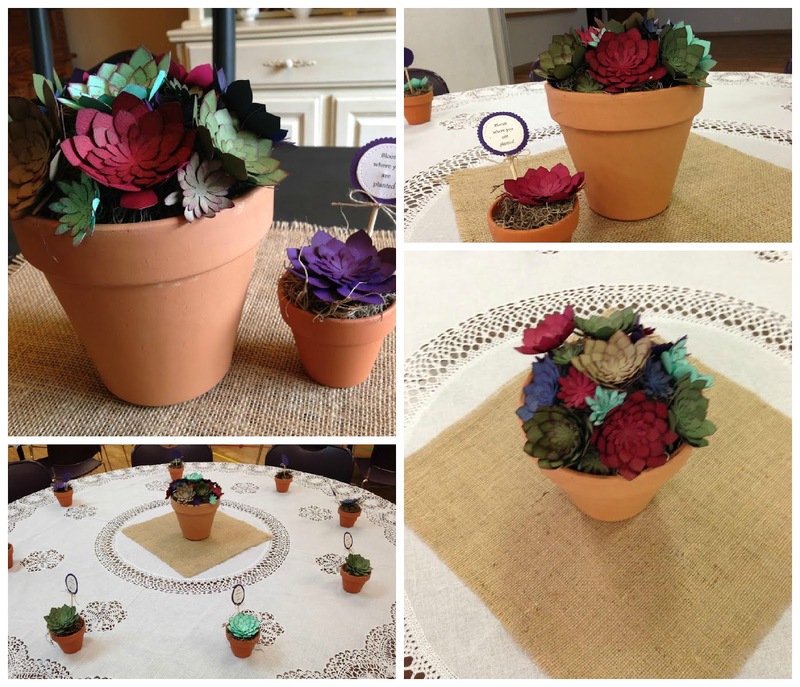 She made them for a women’s event at our church this past weekend! A true labor of love. I wasn’t allowed to post pictures until after the event, (so as not to spoil the surprise), it was killing me not to post because I think these are just stunning! When my photography gets better, assuming that it will, I’ll be able to capture the beauty of creations such as these much better. In person, you can see that every. single. edge. is inked, every one. It’s the ink that makes these come alive! Fortunately for some of my Hostess’s and Team members, there were leftover favors that I got to purchase so I can give them away! But…not before I pulled some aside for myself! 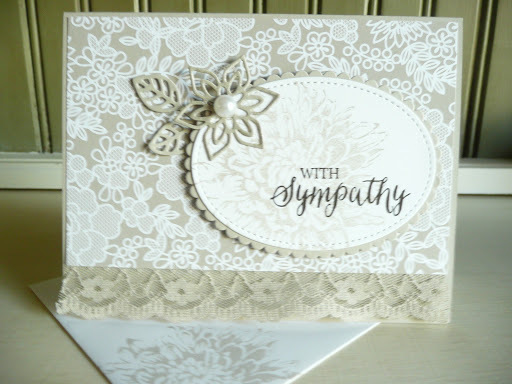 Unfortunately, I have used all of my sympathy cards in this past year. So it is time to make some more so I have some on hand. I hope I don’t have to use them any time soon. 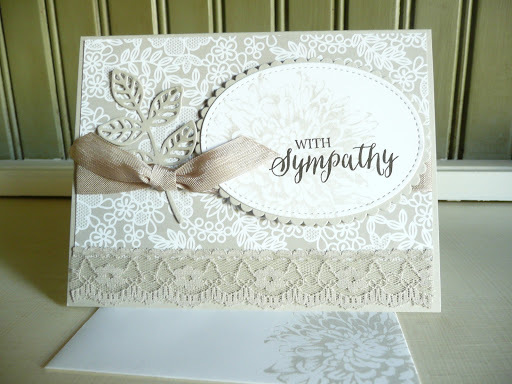 I’m really going to miss Tip Top Taupe, it is definitely one of my favorite Stampin’ Up! In Colors. You can’t really see it in the picture, but I used Wink of Stella on the butterfly from the Butterflies Thinlits set. In person that sparkle is just the right touch. Do you like the monochromatic look? Wink of Stella on the leaves and flower. 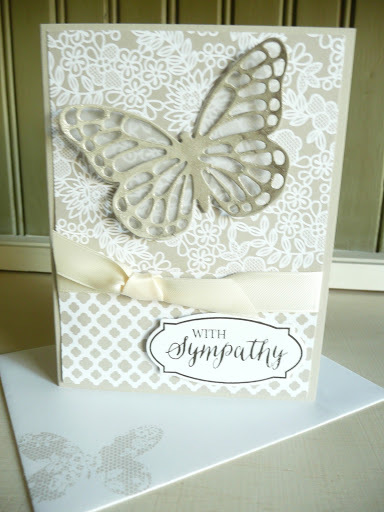 The leaves and the flower die cut are both from the Flourish Thinlits set. The stamped flower is a retired stamp but one I still love! I stamped Pretty Kitty on SU! Watercolor paper. It’s so much easier to paint on the watercolor paper, it doesn’t ball up the paper fibers. I’m no watercolor pro, I just used the new Watercolor Pencils by SU! Just color like you are coloring very lightly with a crayon, then add water! I LOVE the Aqua Painters for this! If you get too much water, just dab it off with a paper towel or something. If you don’t have enough color, color it a little more. You might surprise yourself with how easy it is with very little practice! 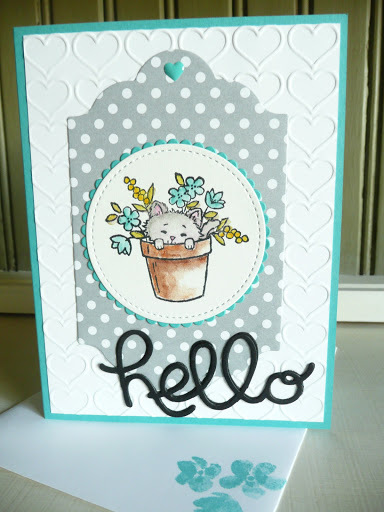 This pretty kitty is surrounded by Bermuda Bay, Stitched Shapes Framelits, Lots of Labels Framelits, Neutrals DSP, Happy Heart Folder, In Color Enamel Shapes and Hello You Thinlits.